Commentary: Are High School Sports Real Life 'Hunger Games'? 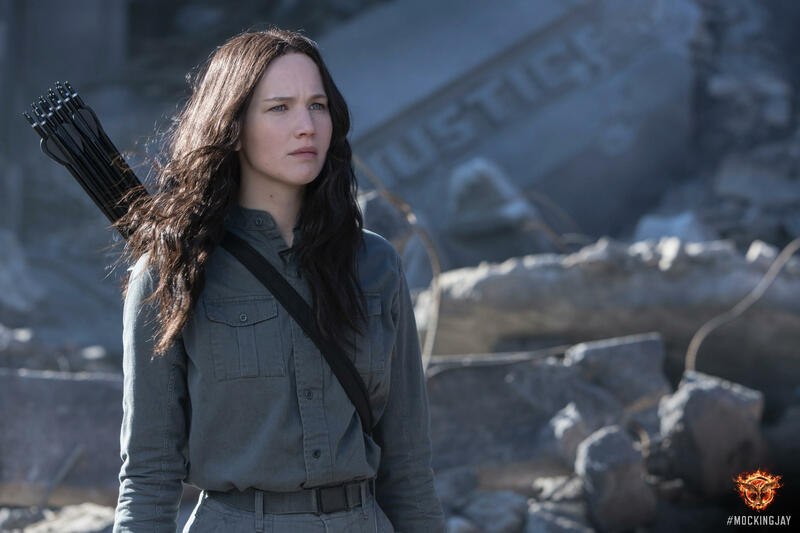 As the latest film in the Hunger Games franchise opens this week, First Coast Connect pop culture philosophy contributor Nicolas Michaud has thoughts on dangerous entertainment both onscreen and on the field. First Coast Connect: Nicolas Michaud on 'The Hunger Games"
Mockingjay - Part 1, the newest installment of The Hunger Games, comes out this week. These films, based on Suzanne Collins’ bestselling book series, have been hugely popular. The stories depict a young woman who must fight for her life in an arena while a hungry crowd watches on. The idea is that, in order to keep a series of rebellious districts under control, the government of Panem annually selects two child tributes from each district who must fight all of the others to the death. Of course, these films and books are so very popular for more reasons beyond that thrill of watching children try to kill each other in an ever-changing, impossible-odds, deadly arena. They address a series of social problems with which we can empathize. The districts are poor, oppressed, censored, and closely monitored, while the rich citizens of the Capitol not only enjoy the decadence afforded them by the toils of the poor, but they get the perverse pleasure of watching the games as the children of the districts fight for their lives. No doubt we find ourselves sympathetic to many of the social issues brought up by The Hunger Games. We might reflect on our own struggling finances, the obtrusive spying of the NSA, or the seemingly steady decline of our civil rights. Why not, though, for a moment, reflect on the most obvious question that comes out of The Hunger Games: are we willing to risk children’s lives for our fun and amusement? Consider high school football. This sport offers tremendous benefit to students. Students learn teamwork, selflessness, dedication, and the value of practice. Not to mention the fact that the game is a smart game. Although it is common to depict football as a game that only requires hard hits and violent plays, it really requires a great deal of thought and strategy. The other side of the coin, though, is that it is rather dangerous to play, especially for high school students. At least, we are so told by a recent study by the Institute of Medicine of the National Academies. In fact, it seems that high school students are twice as likely per “athletic exposure” to develop a concussion as their college counterparts are. Of course, high school football has gotten a fair amount of bad press recently because of a series of student deaths that seem linked to the game. We shouldn’t forget, though, that this is not the only sport that results in brain injury. Soccer is fraught with concussions among high school athletes, for example. Total, we are talking about some estimates of upwards of 400,000 concussions among high school during the 2008-2009 school year. Football, though, also brings with it a bit of social obsession that most other sports do not. We, as a culture, love a good game of football, and it seems we love it even when it is remarkably dangerous for our children... kind of like The Hunger Games. There is, of course, an irony here. The reason why we send children to school is because it is supposed to be good for their brains. If we send them to school, though, and they engage in an activity that is bad for their brains, then we seem to have accomplished the opposite of our goal. Not to mention, there is a lot of evidence that student concussions go under-reported. These students are taught to “play through the pain.” It may not be uncommon for a player, over the course of a high school career, to experience multiple concussions which can kill or lead to serious mental difficulties. After all, if concussions are bad for adult brains, doesn’t it stand to reason that they might be even more dangerous for developing teenage brains? So maybe we aren’t the good guys of The Hunger Games. I wonder, when we send our kids out there to play these sports, if we aren’t a bit more like the Capitol than the poor oppressed districts. After all, high school football isn’t much of a money-maker for a school unless it is for a winning team. When we look at the numbers, we see that teams that aren’t winning make very little money - often at a financial loss for the school. But teams that are winning draw in large crowds, reflected in significant profits. In other words, we tend to only go to the games that our kids risk their lives and brains to play if they are winners. Nicolas Michaud is an author and editor of numerous pop culture and philosophy books. It may be one of the most popular book series and most anticipated movies of the year, but one expert says the real world may resemble the world of Panem more than we realize. Florida State College of Jacksonville philosophy professor Nicolas Michaud joined Melissa Ross Thursday on First Coast Connect to discuss the second movie in the Hunger Games series, Catching Fire, which comes out Friday. With the new film The Maze Runner opening this weekend, First Coast Connect pop culture philosophy contributor Nicolas Michaud has thoughts on the portrayal of men and women in popular media. Commentary: Who Will 'Dawn of the Planet of the Apes' Liberate? What are the Planet of the Apes films really about? It’s a question on the mind of First Coast Connect contributor Nick Michaud as the latest installment in the series is about to hit theaters. In 1968, the Planet of the Apes shocked audiences. An astronaut (Charlton Heston), stranded on a strange world, finds himself imprisoned by talking apes. Our hero fights valiantly to free himself and the other human slaves.